Businesses that are opening or experiencing a milestone often celebrate their achievement with the cutting of a ceremonial ribbon. 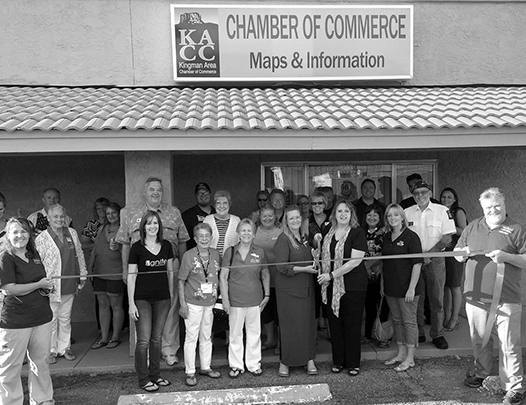 The Kingman Area Chamber of Commerce provides ribbon cutting services to members for free. The Chamber sends invitations to ribbon cuttings in the Weekly Insight email calendar. If requests are received in time, the event will be announced in the Chamber's Monthly News Page in the Kingman Daily Miner on the 1st Sunday of each month. The Chamber also sends out an email blast announcement to its entire mailing list and Facebook audience the week of the event. If a graphic is provided, the Chamber will include that in the email blast and Facebook announcement. Photos from the ceremony are included in the Chamber News Page the following 1st Sunday of the month if it occurs at least a week prior to the 1st Sunday of the month. Photos are black and white only and are modified by the newspaper to allow for page layout. No guarantee of newspaper photo size and/or placement is made by the Chamber, Kingman Daily Miner, or other related entities.